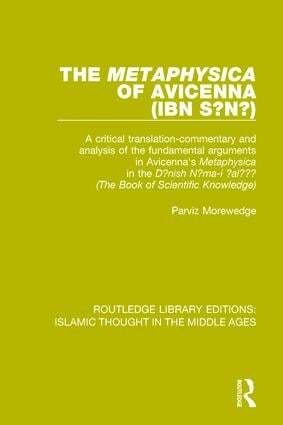 In this book, first published in 1973, Professor Parviz Morewedge, an expert on Islamic philosophy and mysticism, provides a critical exposition of one text of ibn Sina (Avicenna), the great Persian philosopher who lived from 980 to 1037. The text is his Metaphysica in the Danish Nama-I ‘ala’I (The Book of Scientific Knowledge). In addition to a translation of the text from Persian into English, this edition includes a critical commentary on the major arguments found in the text, and notes and references to other texts of ibn Sina as well as to relevant texts of Greek philosophers, particularly Aristotle, Plotinus and Proclus. There is also a glossary of the key terms used in the Metaphysica, with their Persian, Arabic, Greek and Latin equivalents where necessary. This book is concerned primarily to show that although in the text ibn Sina resorts to the Aristotelian vocabulary and Neo-Platonic themes, and appears to be in accord with the Islamic tradition, there is evidence that many doctrines expressed by him may be considered non-Greek and non-Islamic. These include his peculiar doctrine of Self (nafs) and the doctrine of the Necessary Existent (wajib al-wujud). The author attempts to clarify the extent to which salient features of ibn Sina’s position are in agreement with what may be regarded as Sufic doctrines.